Rowan County and Eastern Randolph completed three-game sweeps in their second round Area III American Legion Baseball Playoffs Wednesday. Rowan beat Mocksville-Davie 14-4 to advance. Eastern Randolph beat Kernersville 11-5. Davidson County beat Randolph County 8-7. Randolph leads the series 2-1. The winner plays #1 seed Rowan. Eastern Randolph, the #3 seed, advances to play High Point (#2 seed)/Winston-Salem (#7 seed) winner in Round 3. High Point beat Winston-Salem 21-10 Wednesday. High Point leads 2 – 1. Area III Legion Round 3 begins Sunday, July 12, 2015 at higher seeds. It is a best of five series with six playing dates (ends 7/17/15). Home field advantage for Eastern Randolph vs. High Point/Winston-Salem winner will be determined by highest seed of the three teams. A special thanks to J.T. Bost for providing scores and standings all season long. This year’s Giordana Crossroads Classic will be held in Mocksville, Statesville, Asheboro and Salisbury. For the first time in many years, there will not be an event in Cabarrus County. 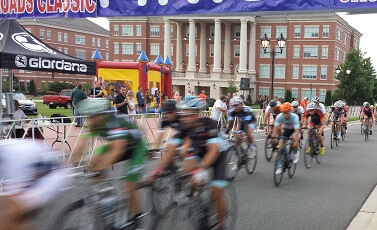 Last year the event featured bicycle racing at the N.C. Research Campus in Kannapolis. It previously had been held in Downtown Concord, but construction of the new Concord Municipal Building at the corner of Market Street and Cabarrus Avenue disrupted the race course. The race promoter said lack of sponsorship is the reason there will be no event in Cabarrus County.